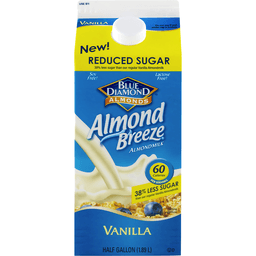 Blue Diamond® Almonds Almond Breeze® Almondmilk Original. 60 Calories per serving. 96 fl oz (2.84 L). Free of dairy, soy, lactose, cholesterol, peanuts, casein, gluten, eggs, saturated fat and MSG. 50% More calcium than dairy milk*. An excellent source of vitamins D and E. Made in a peanut-free facility. Perishable. Non-GMO Project Verified. nongmoproject.org. 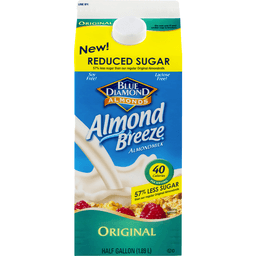 *1 Cup of 2% fat dairy milk contains 30% DV calcium vs. 1 cup of Almond Breeze Original Almondmilk contains 45% DV calcium. Based on 1,000mg calcium recommended daily intake. Milk (01079) data from USDA National Nutrient Database for Standard Reference, Release 28 (2016). Patent US D478,288S. Questions or Comments: Write Blue Diamond customer support, PO Box 1768, Sacramento, CA 95812 or Call 1 (800) 987-2329. Please include code number found on package with all inquiries. 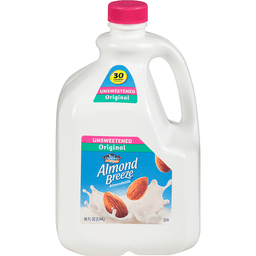 Visit: www.almondbreeze.com. 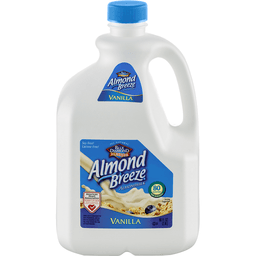 Blue Diamond Almonds® Almond Breeze® Almondmilk Vanilla. 80 Calories per serving. 96 fl oz (2.84 L). Free of dairy, soy, lactose, cholesterol, peanuts, casein, gluten, eggs, saturated fat and MSG. 50% More calcium than dairy milk*. An excellent source of vitamins D and E. Made in a peanut-free facility. Perishable. Non-GMO Project Verified. nongmoproject.org. 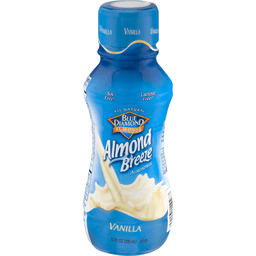 *1 Cup of 2% fat dairy milk contains 30% DV calcium vs. 1 cup of Almond Breeze Vanilla Almondmilk contains 45% DV Calcium. Based on 1,000mg calcium recommended daily intake. Milk (01079) data from USDA National Nutrient Database for Standard Reference, Release 28 (2016). US Patent No: D478,288S. Questions or Comments Write: Blue Diamond customer support, PO Box 1768, Sacramento, CA 95812, or Call: 1 (800) 987-2329. Please include code number found on package with all inquiries. Visit: www.almondbreeze.com. Organic almonds. 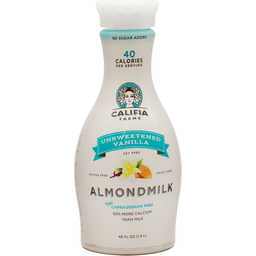 Carrageenan free. USDA Organic. Certified Organic by Oregon Tilth. Non GMO Project verified. nongmoproject.org. Organic is always non GMO. 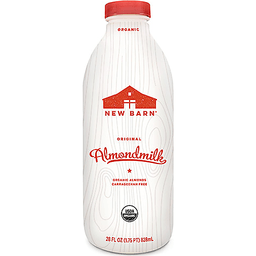 Almondmilk from almonds - Imagine that. On most farms, the barn is where everyone gathers to begin and end the day. It's a symbol of meeting up, checking in, and working together to make something beautiful. We employ this same approach in every product we make. 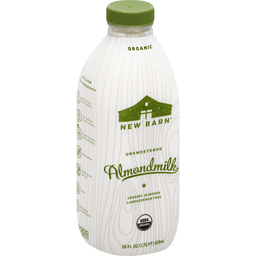 You're holding a bottle of real, Organic Unsweetened Almondmilk just like you would make at home. The taste and texture come from using lots of almonds, not loads of unnatural flavors or gums. We soak and blend organic almonds, a spot of organic acacia (natural sap from the acacia tree) to keep it blended, and a touch of sea salt. That's it. Then we bottle it so it's super convenient for you. Just a few, clean, simple ingredients. Enjoy. More at thenewbarn.com. Just a few clean ingredients. Made with only 4 basic ingredients. Lots of almonds - just like homemade. Organic for you, the planet and the bees. No carrageenan. Gluten, soy, and dairy free. Vegan. Non-dairy beverage. Gluten free. BPA free and recyclable bottle.